A solidly built and sublimely skilled on-baller, Jack Charlesworth was an integral member of the dominant Cananore teams of the 1920’s. Born in 1895, Jack Charlesworth was still a schoolboy at Hobart’s Queen’s College when he made his first senior appearance for Cananore in 1912, aged just 16. The following year, he was a member of the Canaries side that annexed the TFL premiership, and would certainly have played in the State Premiership game had Cananore’s intended opponent Launceston not forfeited the match. The following year, Charlesworth was transferred to the state’s west coast, and after spending some time playing with Silver King in the Zeehan Football Association he returned to Hobart in 1919, re-joining Cananore as the TFL competition resumed after the WWI-enforced recess. Upon his return, Charlesworth quickly established himself as a crucial cog in the Canaries’ midfield. 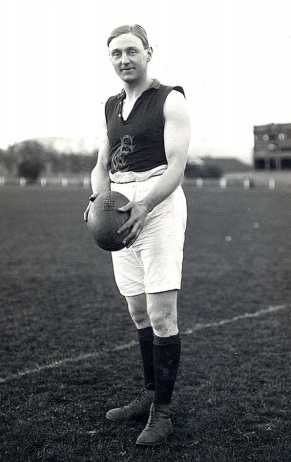 A classic ‘Collingwood Six-Footer’, Charlesworth was expert in utilising his size to great effect, whether it was as an effective tap or knock ruckman or as a surprisingly speedy centreman. With celebrated champions players such as Charlesworth, Horrie Gorringe, Fred Pringle, Jack Gardiner and Fred ‘Cocky’ Aherne in their ranks, Cananore developed into one of the most powerful teams Tasmania has ever seen, claiming a total of 10 TFL and State premierships between 1921 and 1927; this included a hat trick of TFL/State doubles from 1925-27, triumphs of which Charlesworth was at the forefront, having been appointed club captain in 1924. It’s hardly surprising therefore that Charlesworth was one of the first picked players for not only TFL combined teams (featuring more than 20 times) but also for Tasmania, with Charlesworth representing his state on more than a dozen occasions, including at two National Carnivals in 1924 and 1927, the latter as captain. However, arguably his greatest representative success came in one of Tasmanian football’s greatest victories, against South Australia in Adelaide in 1923. Given no chance against the home side, the TFL team recorded a famous 32-point victory, with Charlesworth kicking two goals and completely blanketing Sturt champion – and future test cricketer – Victor Richardson, regarded by many at the time to be the best centreman in the country. These sorts of outstanding performances saw Charlesworth regularly approached about crossing to Victoria to play VFL football, however – as was the case with many of his teammates – Charlesworth resisted all offers, content to simply ply his trade in Tasmania. After a decade of success, Cananore could manage just a solitary win in 1929, and after 196 games the 34-year old Charlesworth decided that enough was enough. He retired from the game with an incredible CV and a name as one of Cananore’s all-time greats, and his years of outstanding service were subsequently rewarded when he was afforded Life Membership of the club. One of the most popular personalities in the game in his day, Charlesworth passed away in 1960 at the age of 64.